As you are hard at work on your Splendid Sampler quilt blocks, I am hard at work thinking of ways to quilt all of these beautiful blocks! 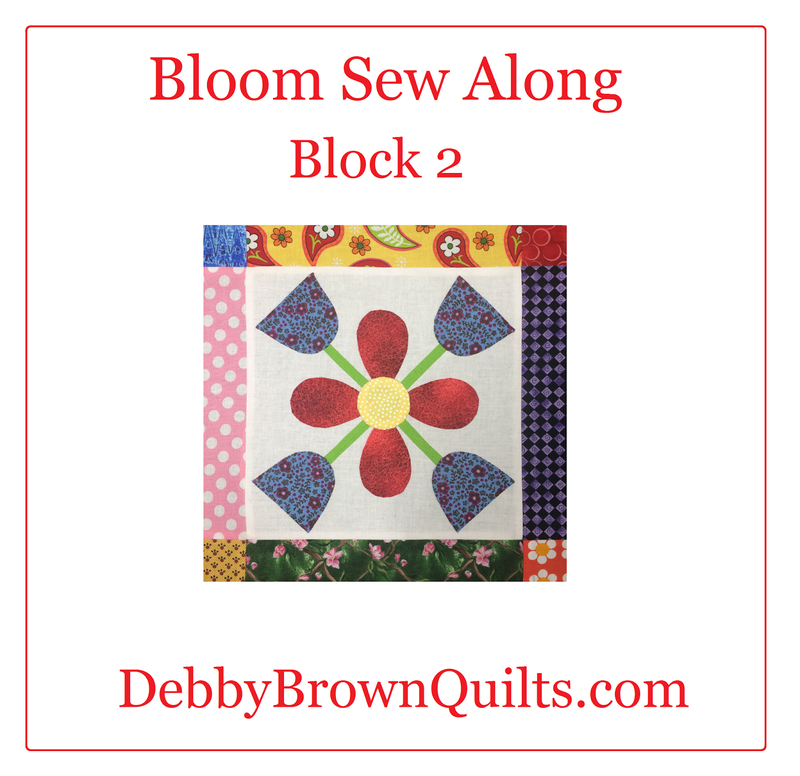 Pat Sloan's Hometown Girl fabrics looked GREAT in this block! I love how my block turned out! If you want more machine quilting instruction, check out my Craftsy machiine quilting classes HERE -- and they are all 50% off! Sign up for my newsletter so you won't miss any of my new machine quilting tutorials. This simple quilt makes me happier than I can express. I love the high contrast of the royal blue fabric against Pat Sloan's fabrics. This quilt has a 20-inch block. That's a big block! I used Royal Robes, one of my FabuLux threads, on the royal blue fabric. Since the thread is blue, purple, and green it might seem risky, but I quilted a pillow as a test to see if I liked the thread color. I did! I really liked the color! I used a Mini Scallop ruler with Handi Grip to quilt the simple "X" in each rectangle. 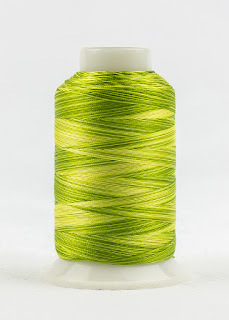 I chose Hint of Lime from my FabuLux threads because... well... it's LIME! This quilt has to work as a sample for a while, but I will pine away for it an anxiously await its return! So, I've now made three quilts from the same fat quarter pack from Quilting Possibilities, and I still have fabric left. Which quilt should I make next? I'm a little behind on Lori Holt's Bloom Sew Along blocks. The sew along is over and I'm on block two, so I think that technically makes me a LOT behind! Are you as overwhelmed with the adorableness as I am? I am making this quilt from scraps and apparently I have really darling scraps. I had to join blocks One and Two together, just to prove to myself that this as the cutest quilt ever. Am I right? Or, am I right? I will be traveling this week and hope to take Block Three with me, prepped and ready to hand applique. Have InvisiFil thread, will travel! In last week's FaceBook Live video (Debby Brown Quilts), I asked if you wanted me to film a tutorial on how I quilted some scrappy placemats. The answer was "Yes!" but perhaps I should have asked if anyone could guarantee that I had electricity? It's been a rough summer in my forest with trees falling on wires weekly, but (fingers crossed) I have power and can upload the video now. Read the full details about this baby quilt HERE. I quilted the golden background fabric using Midas Touch, one of my FabuLux threads from WonderFil. Surprising no one, I used a lot of Ribbon Candy. A Lot. If the tress keep standing and the electricity stays on, I hope to have more videos for you shortly. Happy quilting! I just finished a super-sweet Cutie Quilt from my Share and Share Alike pattern. The fabric line is Baby Gone Wild from Clothworks designed by Masha D'yans. I used wool batting from Fairfield and the loft shows off the quilting beautifully! I quickly pieced and quilted it as soon as I got home. I love having pre-cut quilt kits ready for me to push through my machine! I chose an unexpected thread color for quilting this quilt -- Rocking Horse in my FabuLux line. It is pastel peach, blue, and mint green. 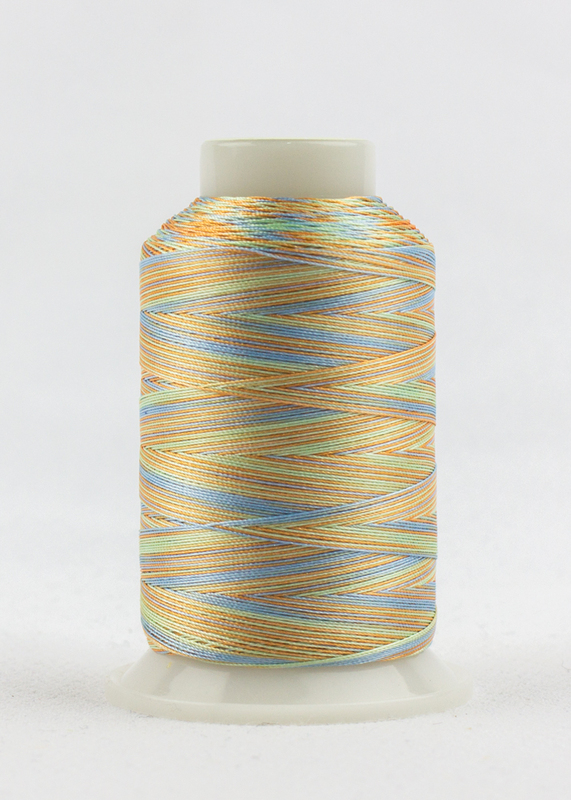 At first look, this thread shouldn't look good on this quilt. After quilting, though, I'm completely convinced it was the best choice! This quilt is currently hanging in the Quilt Basket booth at World Quilt Show New England in Manchester, NH. If you are visiting that show this weekend, stop by and have a closer look! Bobbins & Bits Pillow -- I passed the test!!! I did it! I quilted up a pillow as a thread test for a larger quilt and I learned so, So, SO much!!! The quilt pattern this was a leftover from is Stepping Stones. The pillow pattern is Complete Your Suite Accent Pillow. The threads are Hint of Lime FabuLux and Royal Robes FabuLux. 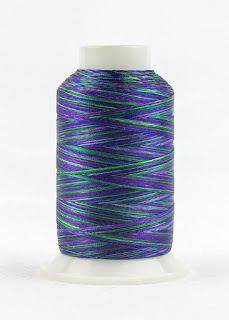 The test was to see if I liked the variegated green/blue/purple thread on the blue fabric. Honestly, when I quilted the pillow I wasn't in love with the thread choice but I wanted to wait a few days to see if it grew on me. I filmed a video of the quilting, showing free-motion quilting and ruler work on my new Handi Quilter Stitch 710 machine! 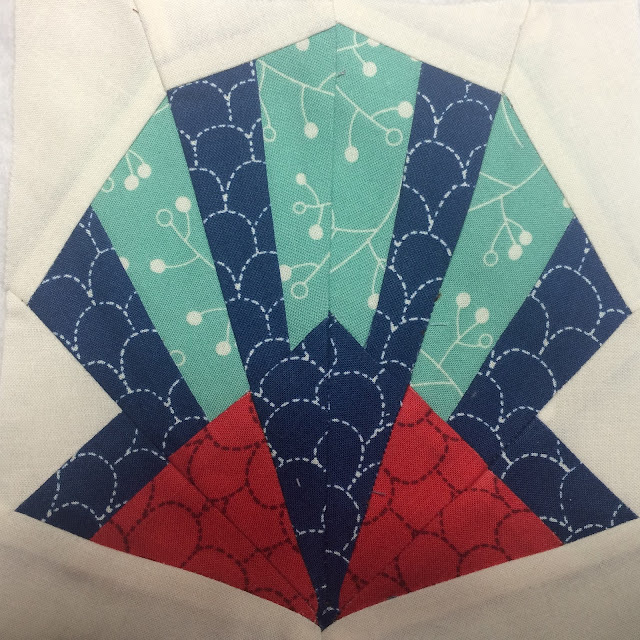 In the video, I used a Handi Quilter Mini Scallop Ruler and Handi Grip to keep it from sliding around on the fabric. I quilted this before my trip to AQS Quilt Week in Syracuse and initially wasn't thrilled with my thread choice. When I got home from the quilt show, though, I stitched this sample into a pillow. Seeing it again after a week away, I really liked the variegated thread. I liked the contrast of the blue fabric against all of the colored rectangles and was worried a variegated thread would lessen the contrast. After a week away, I saw with fresh eyes that it didn't. I will be quilting my Squared Away quilt with Royal RobesFabuLux thread. My test pillow was a huge success!! This pillow is one item in a series that I'm quilting from the same batch of fabric. See more of the projects and more machine quilting vidoes HERE. If you are in love with Pat Sloan's Bobbins & Bits fabrics like I am, I found some in Quilting Possibilities in Forked River, NJ. Stop by their darling shop, or order online HERE. 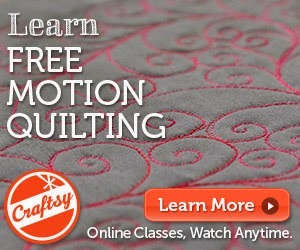 My Latest Craftsy class is online! If you've seen my recent quilts, you know that these designs often show up in my work. Now, you can learn to quilt them yourself! The folks at Craftsy are GREAT! They treat me like a star! I had such a great time filming this, my third class and hope to share even more quilting goodness with you in the future! Use THIS LINK to buy this class for $20 off the regular price.